What originated as a solo project for frontwoman Dejha soon turned into a full band experience. With the addition of former Green Apple Quick Step guitarists Dan Kempthorne and Steve Ross, Presidents of the U.S.A. drummer Jason Finn, and bassist Nick Rinehart, it quickly turned into the power-pop/melodic rock outfit, The Pin-Ups. 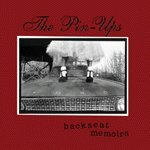 Backseat Memoirs, their debut album, runs the gamut from power-pop to melodic rock ballads. Hard-driving beats, melodic hooks, lust-filled vocals, and a funky side to boot, all play an important part in making The Pin-Ups sound familiarly comfortable, yet distinctively their own. The drumming of Jason Finn is apparent from the opening beats of "Narrow Escape." The simplistically big shatter of the snare typical with P.U.S.A. is added to the soaring, melodic hooks, pushing Dejha's voice into a soul-diva-meets-funk-vixen burst of energy. "Hardache" crashes down on you with plenty of guitar roar, supple drum beats, melodic bass lines, and Dejha's voice; a voice that feels as if it should be crooning and burning up the stage, rather than making you sweat with intense pop music. But, boy does it work. The funky groove of "Poolside" soon rips into more guitar-driven pop music; "Tonight" is a garage-rock-pop jangle; and the bouncy ballad "Heaven for You Too" will have you swaying to the ripe hooks. The acoustic rock of "Miss Fortune" is yet another prime example of the ability to diversify and then pull it back together that The Pin-Ups are capable of. The adequate violin reinforces the lush pop of the song while building the intensity; the mellotron adds a quirky touch; and the light stomp of the rhythm section helps the song fully realize its emotionally gripping potential. The metal-gone-pop of "These Days" kicks the temperature up with some rock 'n' roll. And album closer "3:43 AM" gives you a taste of the band's funky side, with a hint of jazz (via the saxophone) spicing up the mix even more. Tight pop songs with punch, The Pin-Ups' debut is a melodically gorgeous, hook-laden album with soul and funk. Dejha is warm and comforting, yet she can command the song and have grab your attention without even blinking. Here is music that is equal parts performance and from-the-heart; I'll give it an A.